Your Easy Business Review - Exposing a Scam! Welcome to my Your Easy Business Review. This is a fairly new website that I've just recently come across, so I thought I'd check it out, and let you know if I believe this is a scam or if we've finally found a legit money making method. Sorry to disappoint you guys again, but what we've got here is just another scam. I'll say that straight away before I go into explaining my reasoning behind this thought. You can instantly see just by looking at it that this is a scam. The fact that they use the term “weird trick”, is an instant red flag for me. There is no such thing as a ‘weird trick' to make money, and anyone who claims there is, is just a fraud. They have very similar ridiculous claims to other scams that I've reviewed and made videos about such as Profit With Our Sites, Clone My Sites, 30 Minute Money Methods. They also claim that newbies just starting out, with no prior knowledge of internet marketing can start earning up to $1,300 a day. This is another ridiculous claim. I've been doing this for years and have numerous online businesses and even I'm only just about getting around that sort of income. To say a newbie just starting out can earn that is 100% false and they're just trying to make you interested so you give them your money. What Exactly Is “Your Easy Business”?? Your Easy Business claims that you can make thousands of dollars per day on autopilot by using their ready made money making websites. The founder of Your Easy Business is apparently named Paula Shaffer. However, a simple search online for her name will reveal nothing. Therefore, we can safely assume that Paula Shaffer is another fictional character, just like all of these other scams out there use. In my many years of running businesses online, I've come across countless videos just like this one, using a paid narrator so the creator can safely hide while scamming people out of their hard earned money. The sales video leads you to believe that Paula will literally do all the work for you and that all you need to do is simply sign up, sit back, relax and watch the money flow in automatically. Claims like this are 100% false. Every single time. I hate to break it to you, but there is no such this as ‘automatic money'. You're going to have to do some work, and anything that claims otherwise are not to be trusted. As usual, just like of these other scams, it doesn't give you any information at all about how the system works. The only bit of information they give you is that you'll be given some ready made websites. Your Easy Business is probably the worst I've seen when it comes to these scams and how much effort they've actually put into it. I can see they haven't even tried. They haven't even paid any actors to give fake testimonials in this one, they've just got a few written testimonials that even a monkey could do. Basically, it just doesn't work. So I can't answer how it works. It promises you your dream life of earning money with no effort, convinces you to join, takes your money and then you’re left with nothing to show for it, except $37 less dollars in your wallet and whatever other up-sells you've been convinced to buy through their lying efforts. All these scam artists are hoping for is that you'll be tempted into ‘trying it out' and you'll give them your $37. The scam is once again run through ClickBetter, so it is possible to get a refund. However, these people are just hoping you won't know about the possibility of a refund or that you'll just forget or not care and they can just keep your hard earned money. Well typically speaking, these scams usually do either one of these things – they either provide you with some very low quality affiliate marketing training (that won't help you at all), or they will redirect you off into a completely different business opportunity. The Verdict – Is It a Scam? In my honest opinion, yes, Your Easy Business is a scam. It’s very misleading, promising things that just aren't possible. This website has been created 100% to make money from your expense. They have no interest at all in helping you earn money online. Their only interest is getting as much money out of you as they possibly can. I would NOT recommend Your Easy Business to anybody. 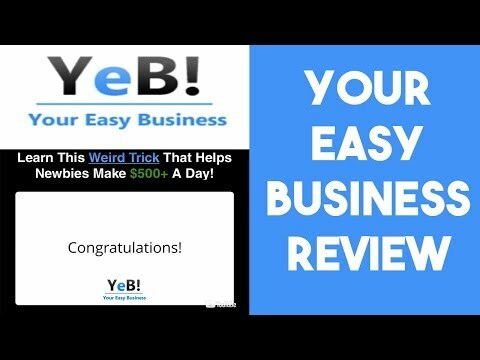 Thank you for reading my Your Easy Business review. Watch my Your Easy Business review video below and don't forget to subscribe to the YouTube channel.